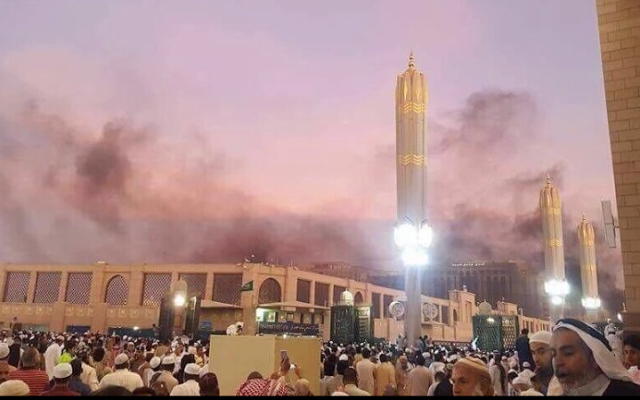 A suicide bomber carried out an attack near the Mosque of the Prophet, originally built in the 7th century by the Prophet Muhammad, who is buried there along with his first two successors. The attacker exploded in a parking lot just outside the mosque’s complex, and was reportedly targeting a team of security guards who were breaking their Ramadan fasts. Bombers also struck in two other cities across Saudi Arabia in an apparently coordinated campaign of attacks. The explosions targeting US diplomats, Shi’ite worshippers and a security headquarters at a mosque in the holy city of Medina follow days of mass killings claimed by the Islamic State group, in Turkey, Bangladesh and Iraq. The attacks all seem to have been timed to coincide with the approach of Eid al-Fitr, the holiday that celebrates the end of the fast. A Saudi security official said an attacker parked a car near the US consulate in Jeddah before detonating the device. The official said the government was checking the reports of blasts in Qatif and Medina. A video sent to Reuters by a witness to the aftermath of the Medina bombing showed a large blaze among parked cars in the fading evening light, with a sound of sirens in the background. A picture sent to Reuters showed a burnt and bleeding man lying on a stretcher in a hospital. A resident of the city reached by telephone said there were believed to be no casualties there apart from the attacker, as worshippers had already gone home to break their fasts. Civil defence forces were cleaning up the area and police were investigating, the resident said. Hours earlier a suicide bomber was killed and two people were wounded in a blast near the US consulate in the kingdom’s second city Jeddah. Police and groups of local volunteers increased security near mosques in Qatif after suicide bombings hit mosques in Shi’ite areas last year, killing dozens. Another suicide blast at a mosque used by security forces also killed 15 a year ago.